I had been wanting to try this technique for a while now and there are a few talented women who rock this style using a chalk-based paint. I wanted to see if blending Fusion would be as easy, and the short answer is YES. 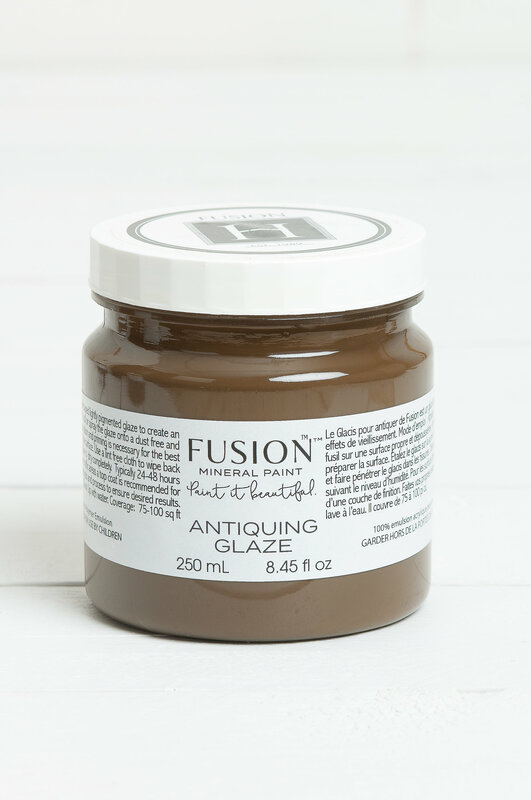 Fusion’s perfect for blending! 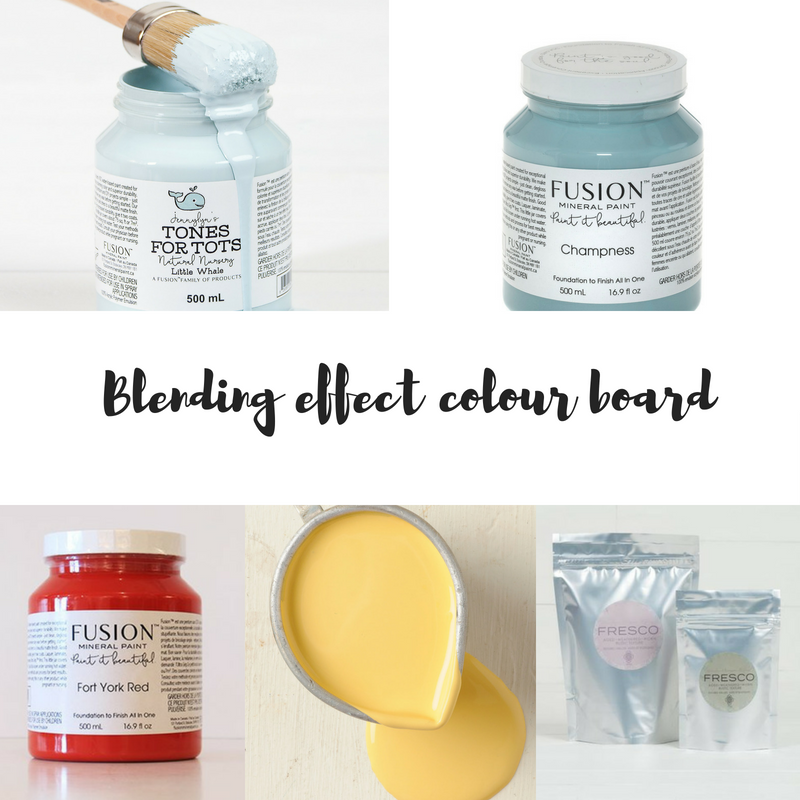 I had no trouble at all getting different shades from just a few colours and if you’d like to see how easy it is to custom blend your own colours check out these YouTube Video’s Jennylyn did a while ago. Blending the colours was the easy part, knowing where to put it had me at a loss. You see, I think this technique would be better suited to someone with an artistic flare…. I struggle to draw a stick man! 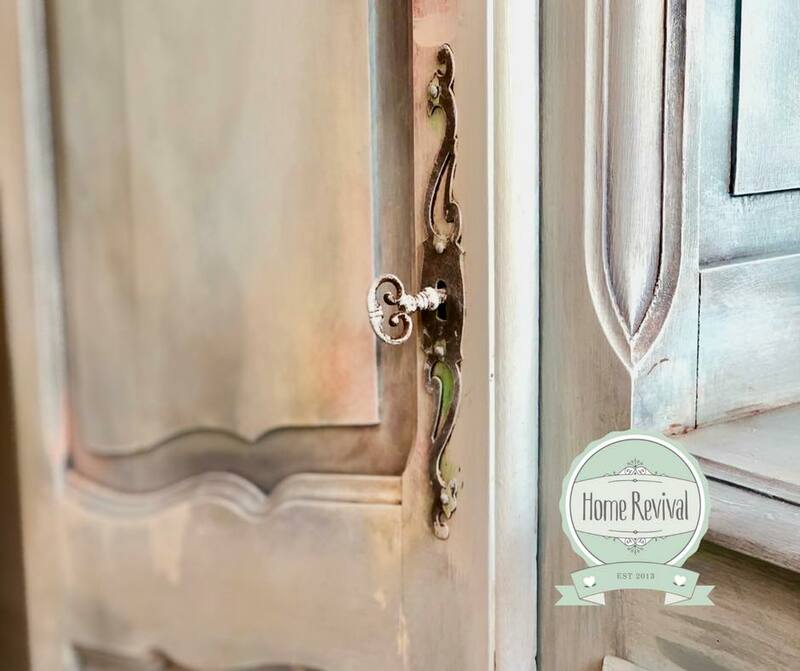 I had to keep referring to old painted doors on Pinterest to better give me an idea of where to add the grungy bits. During the process, I was ready to give up and paint it white!! I really didn’t enjoy it and I think that’s because it took me out of my comfort zone. I am a technical painter by which I mean I like to know the steps, I like knowing what to do next. With this, I had to guess! and that made me feel like a kid with crayons. The moral of this little tale is GET OUT OF YOUR COMFORT ZONE!!!!! Let me know what you think? or have you tried to colour blend Fusion? I’d love to see some pictures. You have asked and Fusion has delivered! These tester sized metallics come in the same colours as the regular sized. Pearl, Brushed Steel, Bronze, Champagne, Pale Gold and Copper. 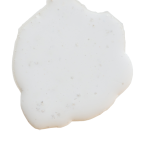 The project pot is 37ml and just perfect for enhancing carvings or adding to your top coat for that perfect shimmer. 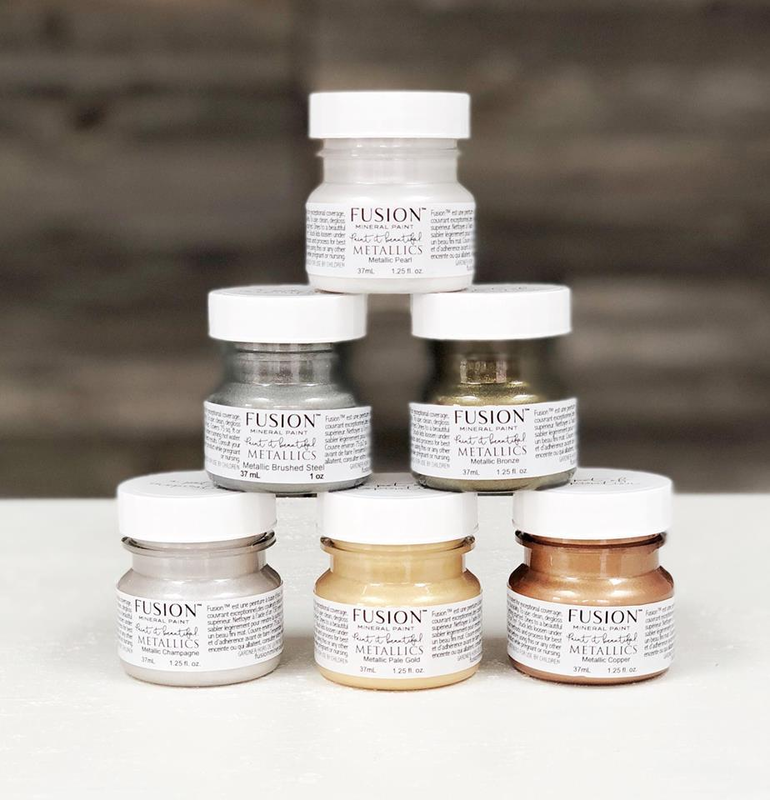 Using pure mica pigments our Fusion™ Metallic shimmer unlike any other on the market. 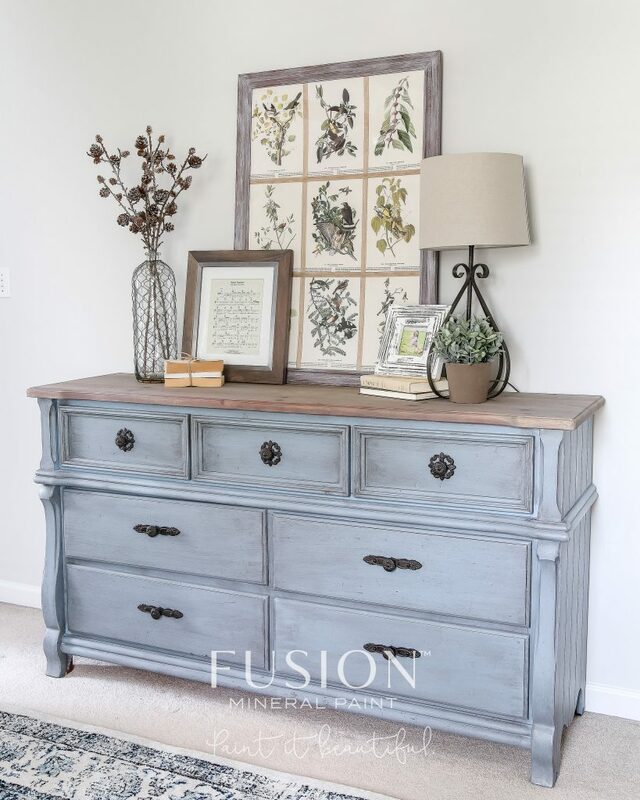 These work just like our regular Fusion™ Paints, however, come in beautiful iridescent shimmer. such as one of the Staalmeester’s gives the best finish. now it couldn’t be easier to add just a bit of wow to your painting project. keep your eyes on your inbox for that. 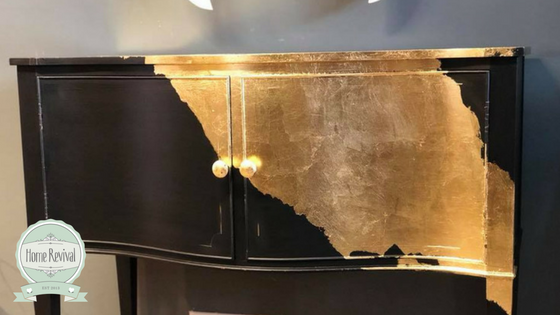 How to Gold Leaf the easy way. If you follow me on Facebook you know I often do FB Lives when I’m in the workshop. I rarely do them at a scheduled time, but if I’m doing something that I think you may like I turn the camera on and show you! Well, I had this piece in the shop and it was plain, as in no carvings! 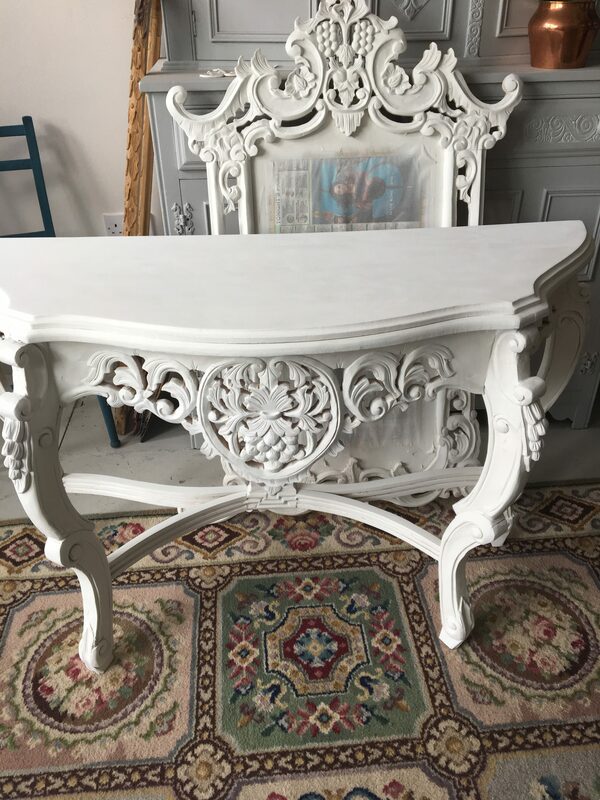 I’m lucky that almost 100% of my furniture comes from France and it’s mostly ornate and carved with lots of details which is fab! 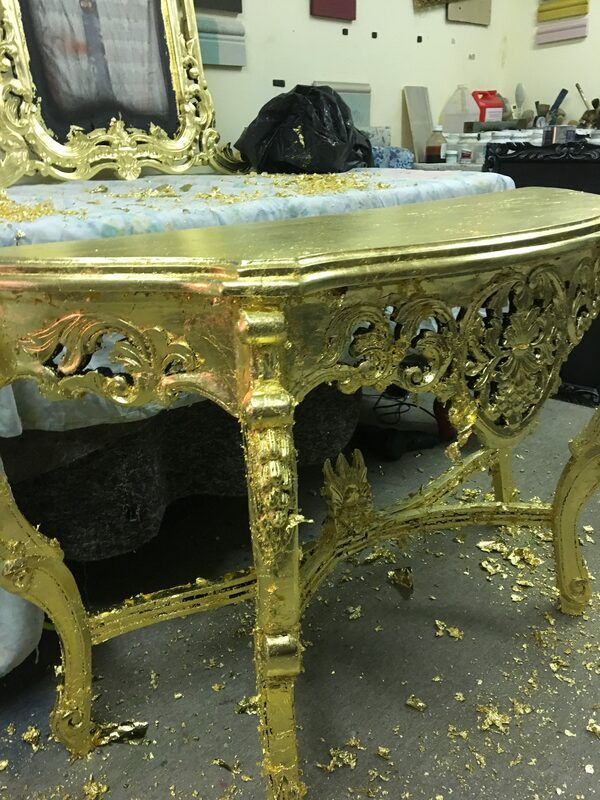 but I needed a flat surface for this Gold Leaf accent that I had been wanting to try. 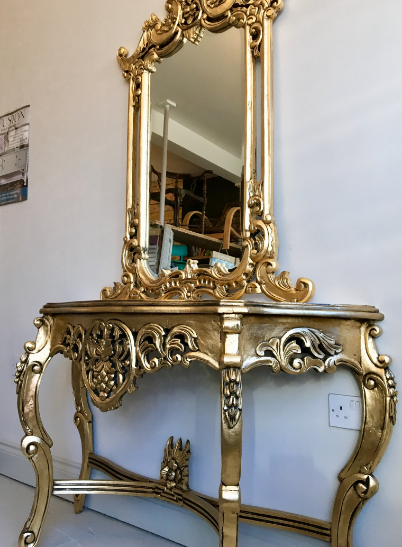 So it was a dark Mahogany colour and quite shiny, I prepped in the usual way by cleaning lightly sanding and I painted it with Fusion Mineral Paint’s Coal Black. You can but Fusion Paint here! 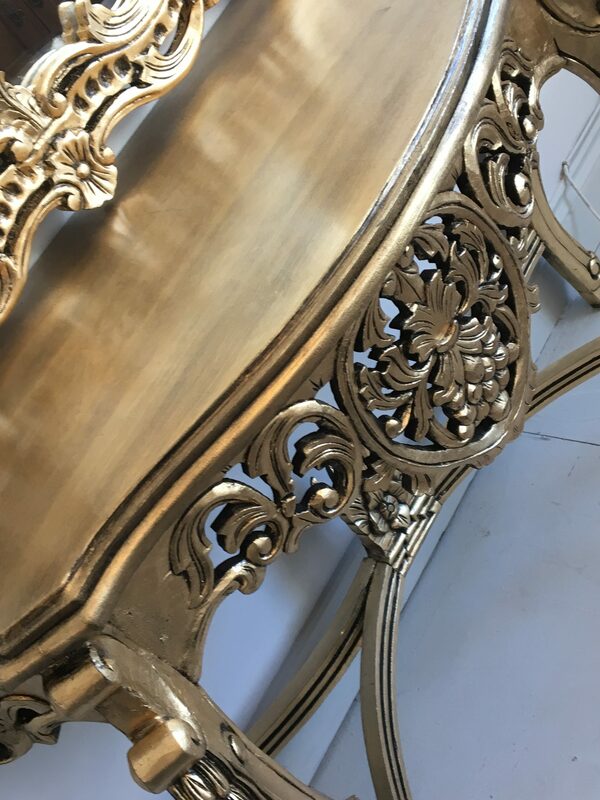 I then added a slash of Gold leaf adhesive across the top and down the front, I used Artisan Enhancements leaf and foil adhesive, but any gold size will work like this one I’ve used this one too. When the leaf size is applied it goes on white and when it comes to tack it’s clear and ready for the leaf. It was about this time that I thought I’d turn the camera on and show you how easy it is! so here is the video, it’s had a good response and people have found it useful so I thought I’d share it with you! Let me know in the comment if you thought it was useful. Virtual Painting Classes. Learn to paint online! Hi everyone ..really long time no see! Everyone is time poor and with our busy lives, we often don’t have time to do the fun stuff! 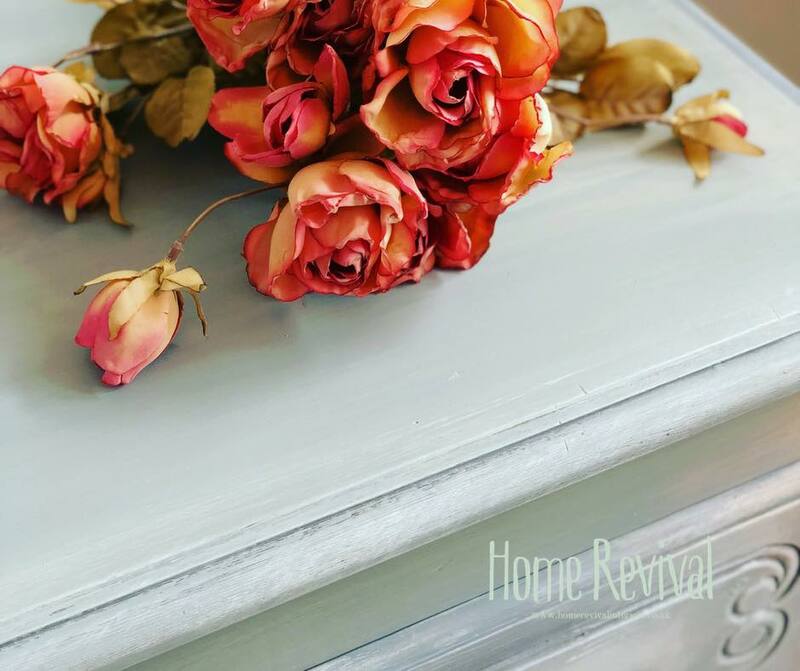 with these classes, you will be able to learn at your own pace in your own home! how awesome is that? Social media gets a bad rap sometimes but one of the bonuses is friendships! meeting like-minded creative people and sharing a fun experience is priceless. Being able to pick up where you left off in your own time is GOLD, No rushing and missing the good stuff, all in your own time. You will be added to a private Facebook group where all materials and info will be listed in advanced inside the group. The tutorial will be LIVE at a specified time arranged in advance, all questions will be welcome, join in! You can paint along or watch and do it in your own time! the video will be available to you for 2 weeks. You have time to perfect this technique, in your home at your leisure. I also will be in this group for the full 2 weeks alongside the other class attendees answering questions giving advise and having fun with you. It’s a fun simple way to do something creative and fun! plus it’s an inexpensive way to learn a new technique. It couldn’t be simpler. The next classes will be listed soon so sign up for the waitlist here! I’ve had lots of people interested and I can’t wait to meet you all inside the group. If you have any questions about the class there is more info HERE or alternatively, shoot me an email or comment below and I’ll be happy to oblige. 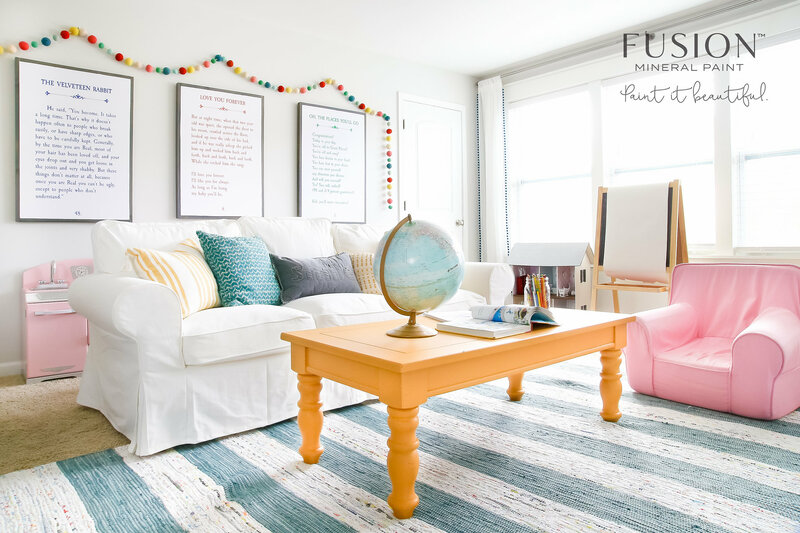 This is the ultimate wish list for anyone thinking about flipping furniture for fun or for profit. All of the links in this post are affiliates, if you purchase from them I will receive a small kickback. First up is a paint sprayer, now if you have ever painted a chair by hand you know this is numero uno on the list. I have extensive knowledge in this area so I can confidently recommend this machine. It’s perfect for beginners, easy to use and clean and leaves a smooth professional finish. I still regularly bring this one out for small to medium-sized projects. Next up we have a circular sander, Tabletops can’t be sanded well will anything smaller, a mouse sander or similar is fine for very small projects but refinishing tables take a little more power. I use this exact one every week and it’s definitely been put through its paces! It easy to use and has an adjustable power level, so it can be used on more delicate surfaces such as veneer. A must have for the furniture flipper. Not all pieces of furniture will require machine sanding, and for hand sanding, I have found THE best invention EVER! 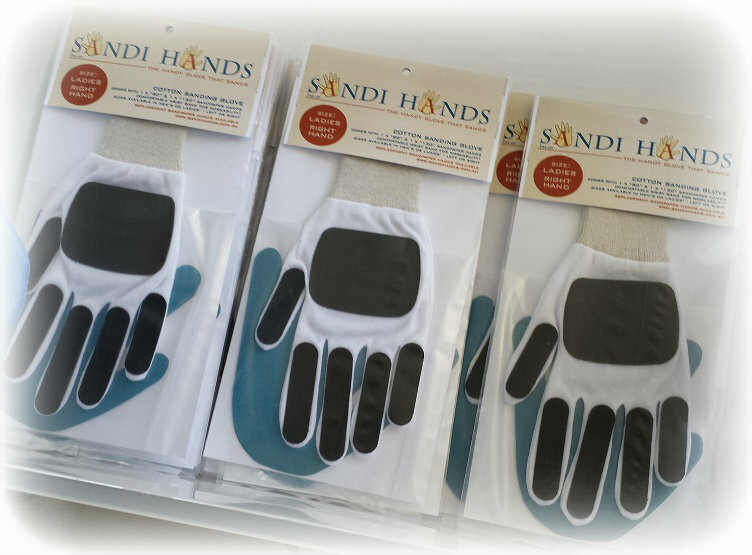 Sandi Hand sanding glove. It was invented by a lovely Australian lady called Jenny you can read her story here! I am the UK & Ireland distributor with stockist in the UK. The sanding glove comes in 2 types, a cotton glove with 2 grits 80 & 120, and a Tradesman glove which is harder wearing. Replacement grits comes in packs of 3 and grits sizes from 80 all the way up to 2000. Its perfect for prep, carvings and hard to reach areas they also work amazingly on spindles! Also on the wish list is some basic tools, all furniture flippers need a few good tools in their arsenal and these will do perfectly! This set comes in a toolbox and let’s be honest, it doesn’t hurt that they are pink! I love that they all match. This one is on my own wish list! We are nearly set! just a couple more items and we will be ready to rock n roll. If we are painting furniture we are going to need brushes… lots and lots of brushes, well that’s not true but we do need a good couple quality brushes. There are hundreds on the market and I’ve tried a whole bunch of them but the ones I love the most are Staalmeester brushes … they are the bomb!! 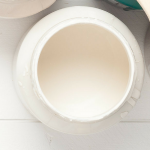 I work with Fusion Mineral Paint and Miss Mustard Seed’s Milk Paint and these brushes are a perfect fit. Lasst but not least some safty gear. Be safe and have fun! So there you have it A Christmas wish list for furniture flippers. I only wish I had these tools when I first started out it would have saved me a blister or 2. If you try any of them out let me know what you think! 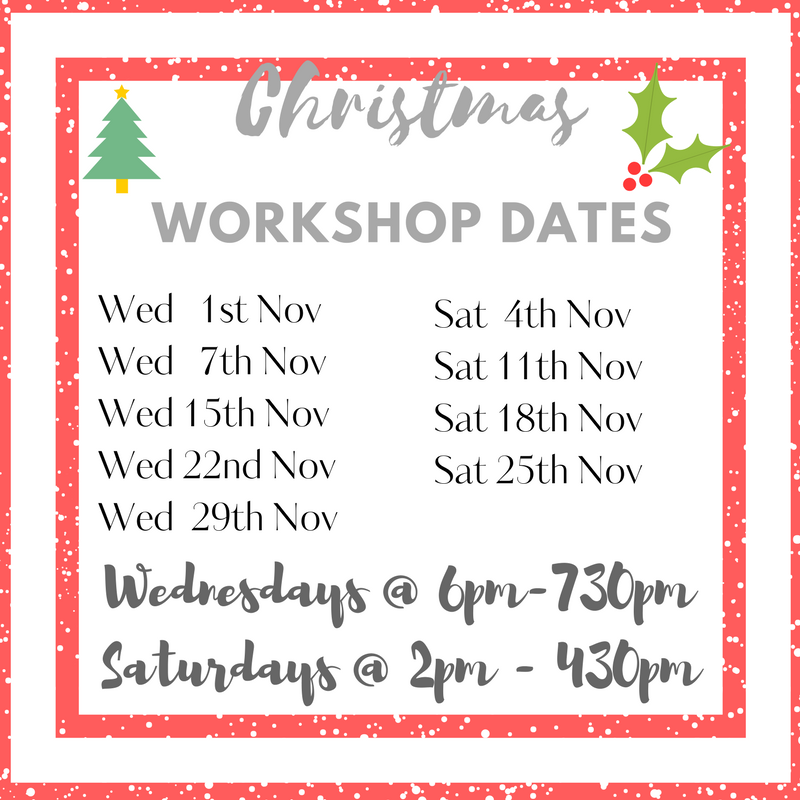 Come to one of our Christmas workshops where you will get to make your own Christmas sign to keep for your mantle or to give away as a present! 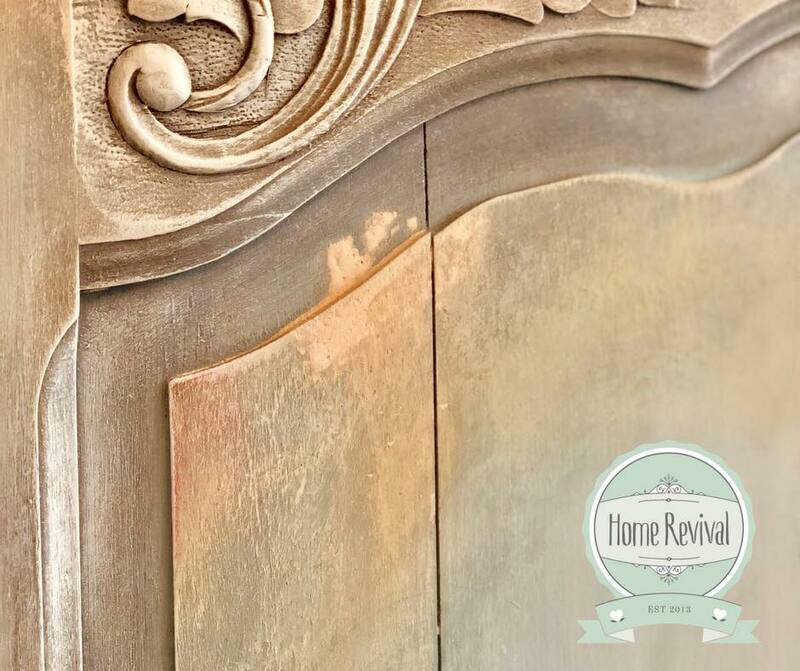 We will use reclaimed wood, Miss Mustard Seed’s Milk Paint, and Fusion Mineral Paint. We will stencil your sign with the world famous Funky Junk Stencils to achieve that authentic rustic feel. We will provide all materials including hot Chocolate and mince pies! A perfect evening to involve your loved ones or as a Christmas gift. 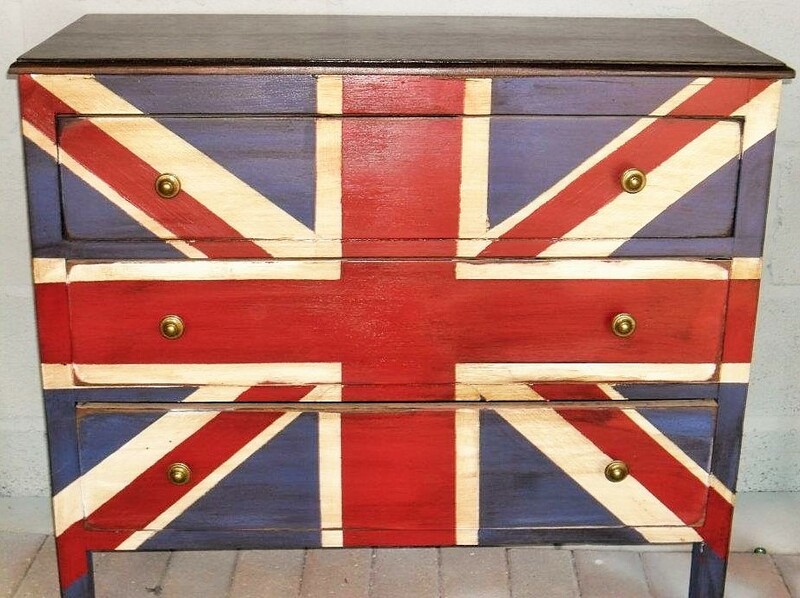 This workshop will give you a chance to work with both the paint ranges we stock and you’ll get to grips with a couple different techniques including Staining wood with Milk Paint and getting a perfect crisp stencil every time! 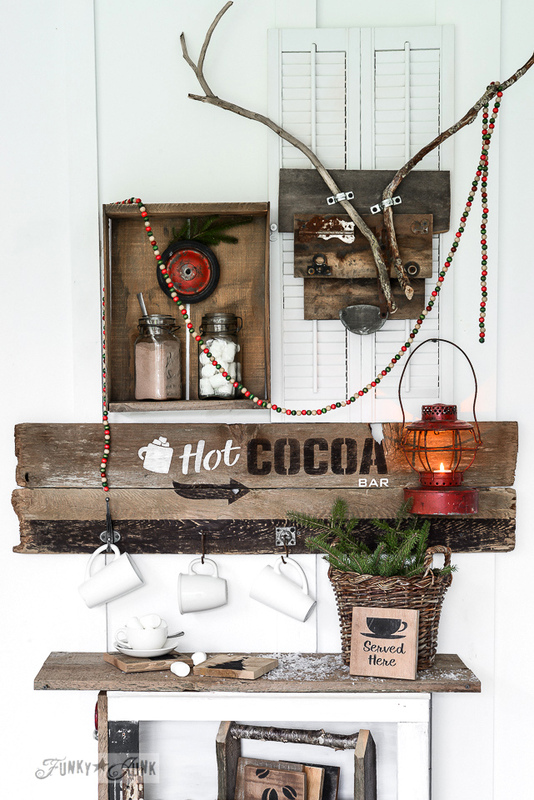 Book our spot now and enjoy your handmade Christmas sign for years to come. 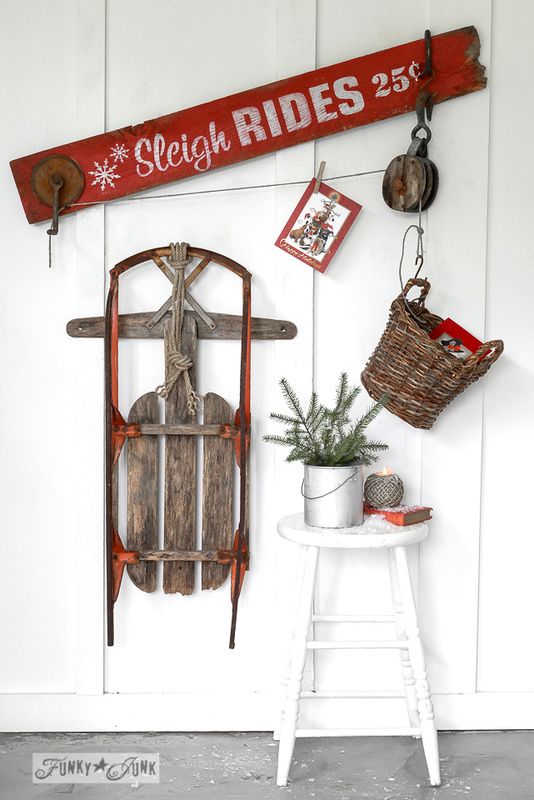 These signs can be placed on the mantle or hung on the wall. 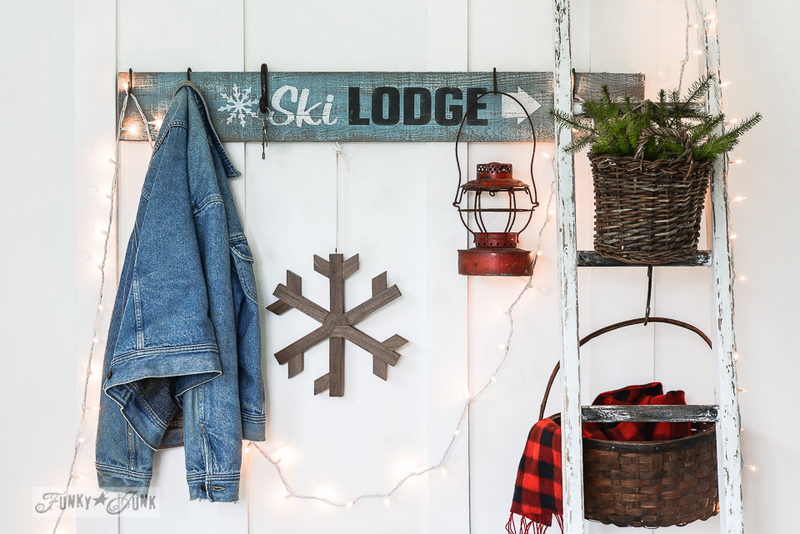 The products we use, make this sign perfect for outdoor use too! The workshop dates are as follows. Last year we had a huge amount of people asking for alternative days and times, so we listened! we will be running the workshops every Wednesday and Saturday in November including evening and daytime classes. 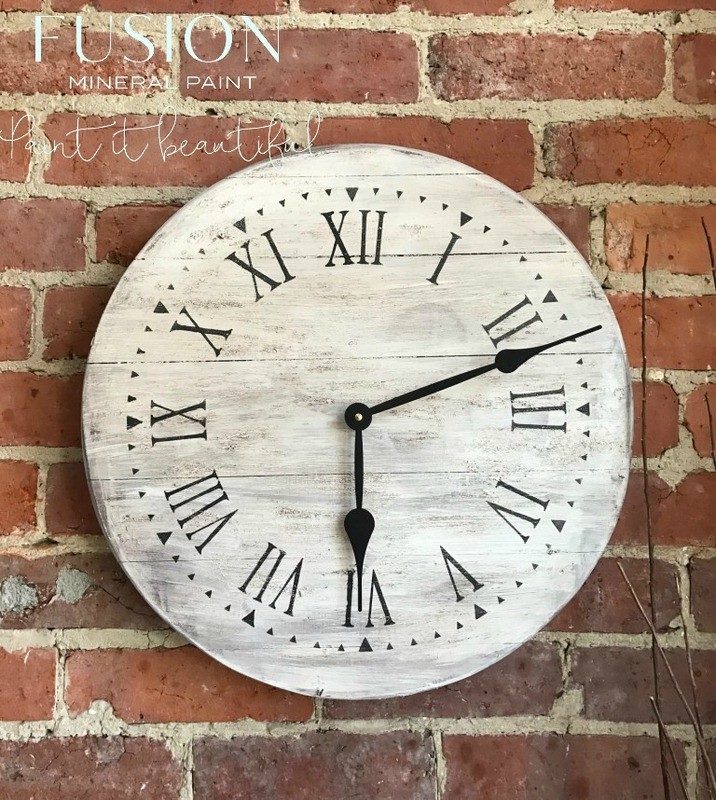 December’s workshops will include making a 24″ Farmhouse style clock! Like this one. So make sure you are subscribed to our website or Facebook messenger bot ( click here to do that ) to get the latest dates and times for all the upcoming workshops. Come Get Messy! 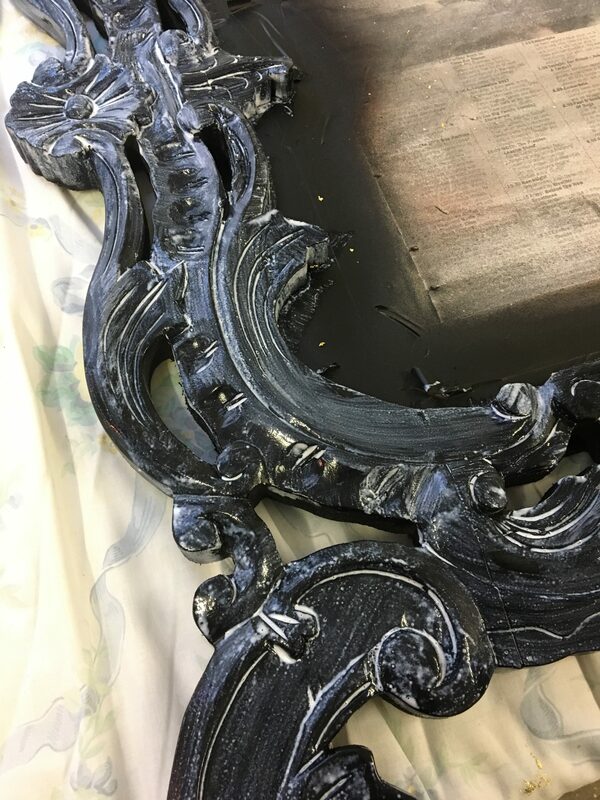 As a decorative furniture painter for over 10 years, I have used a lot of paint! 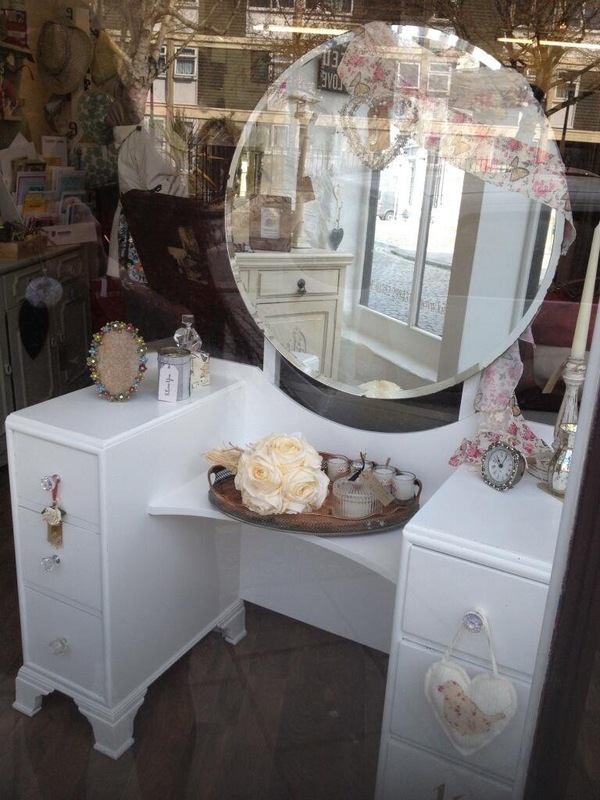 Before I had the shop I sold to the public and also to other retailers in my local area. 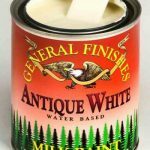 Those retailers were stockists of different paints and so I had a fair bit of experience with a whole range of paint brands. So without further ado here is my list of top 10 neutral paint colours for furniture. 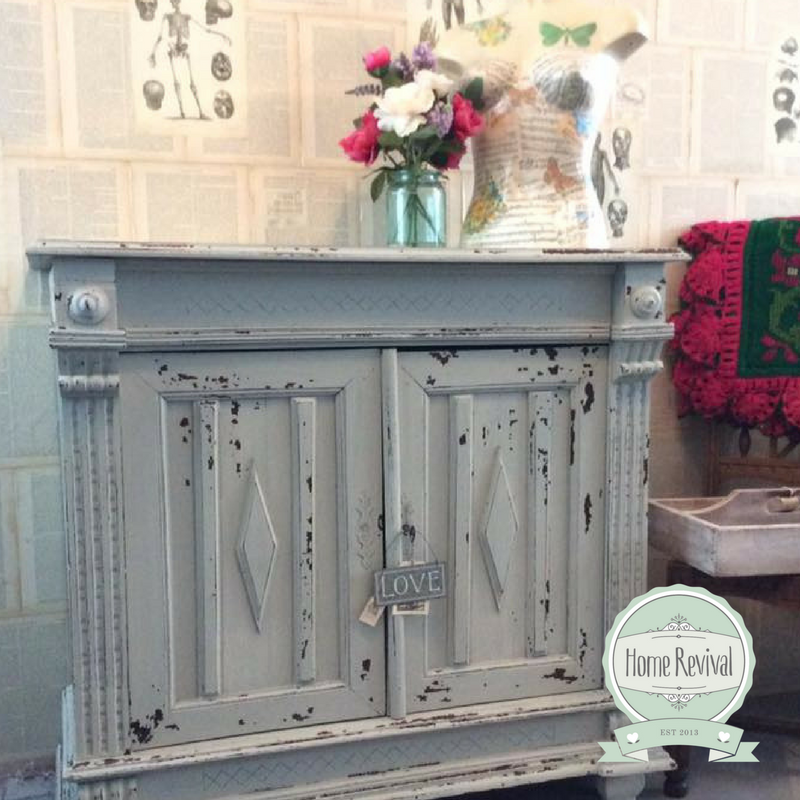 No 10 Annie Sloan Country Grey. 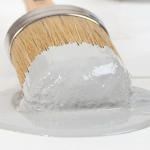 Country Grey is a soft beige that reads slightly green. 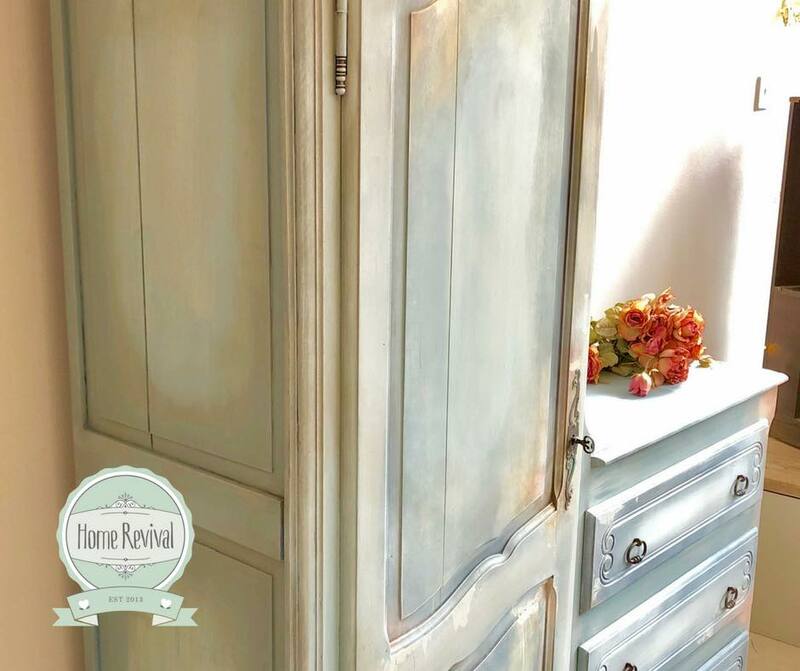 It has warm umber undertones and pairs great with blues and greens. 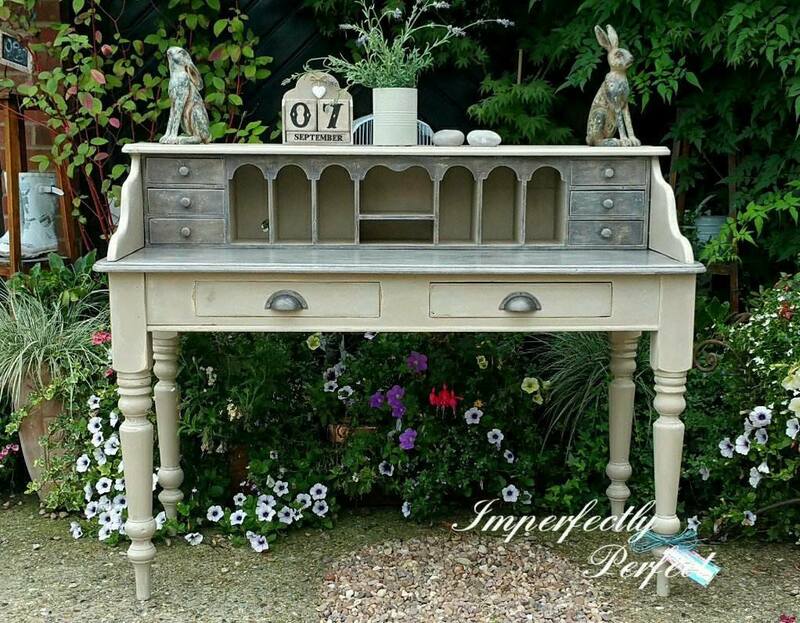 Jo from Perfectly Imperfect did a fantastic job on this bureau click here to see the details on her Facebook page. A yellow based off-white, rich warm and pairs well with natural wood tones. I painted this cute breakfast set a few years back and I still love it. 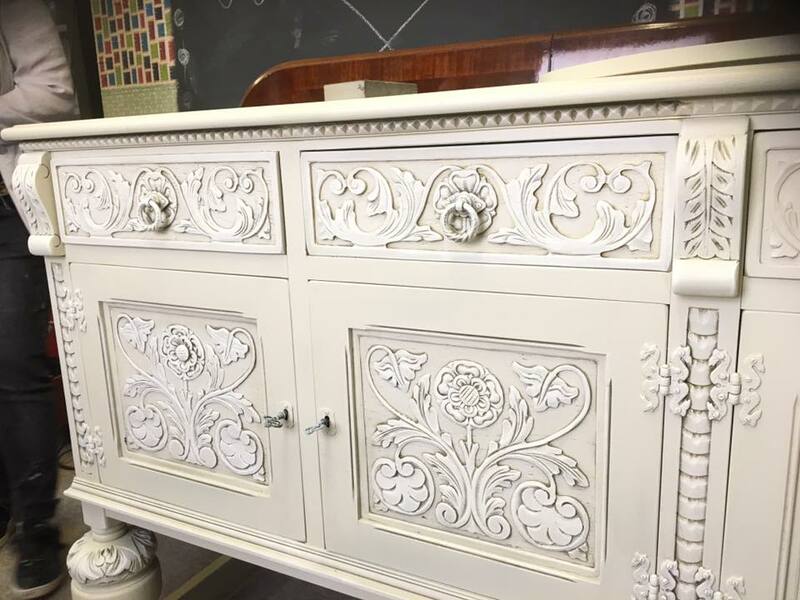 No 8 General Finishes Antique White. A lovely off-white, with a grey undertone this is a great white to pair with any colour. 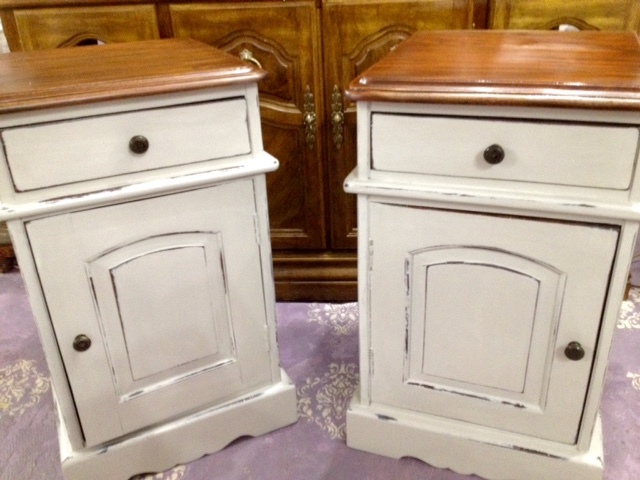 General Finishes Antique white bedsides. 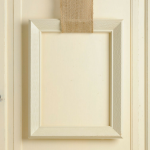 No 7 MMS Milk Paint Linen. A beautiful soft creamy white, not too yellow, almost an aged white with warm undertones. 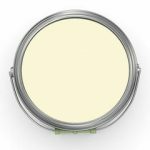 My go-to Milk Paint colour when white is too bright. 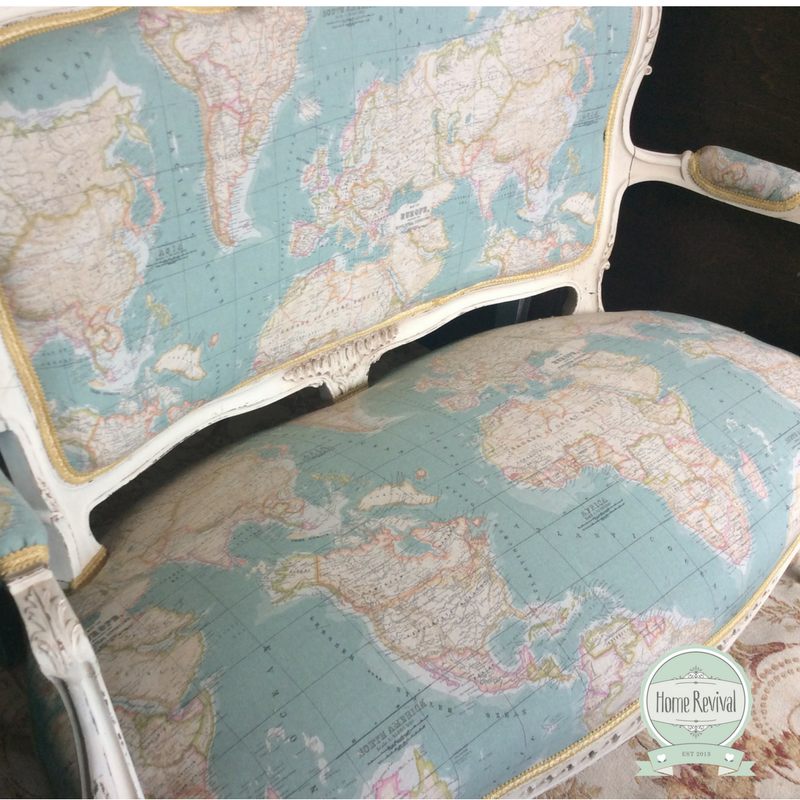 A pretty French Settee. The Frame is painted in Linen. 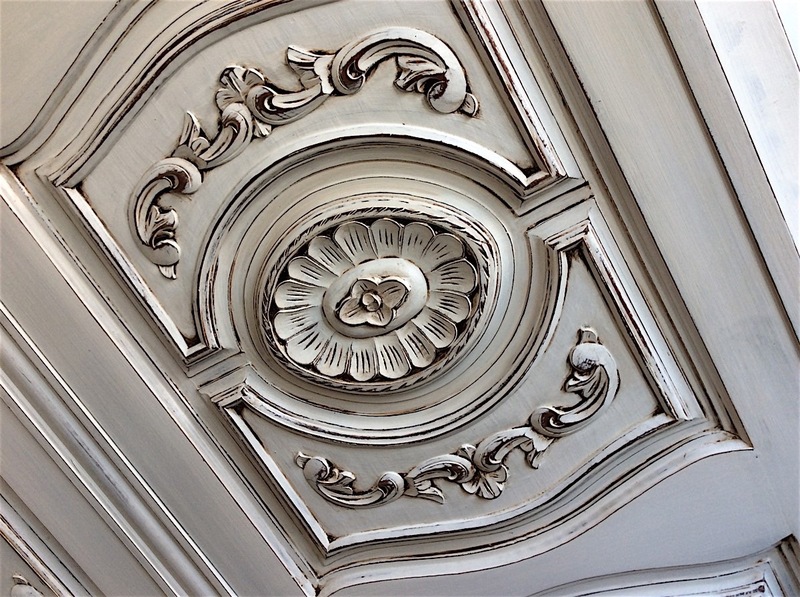 No 6 Fusion Mineral Paint Catherdal Taupe. 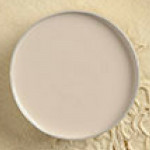 Offering the slightest hint of a soft pink undertone, this neutral taupe goes with virtually anything! It’s my favorite go-to beige. 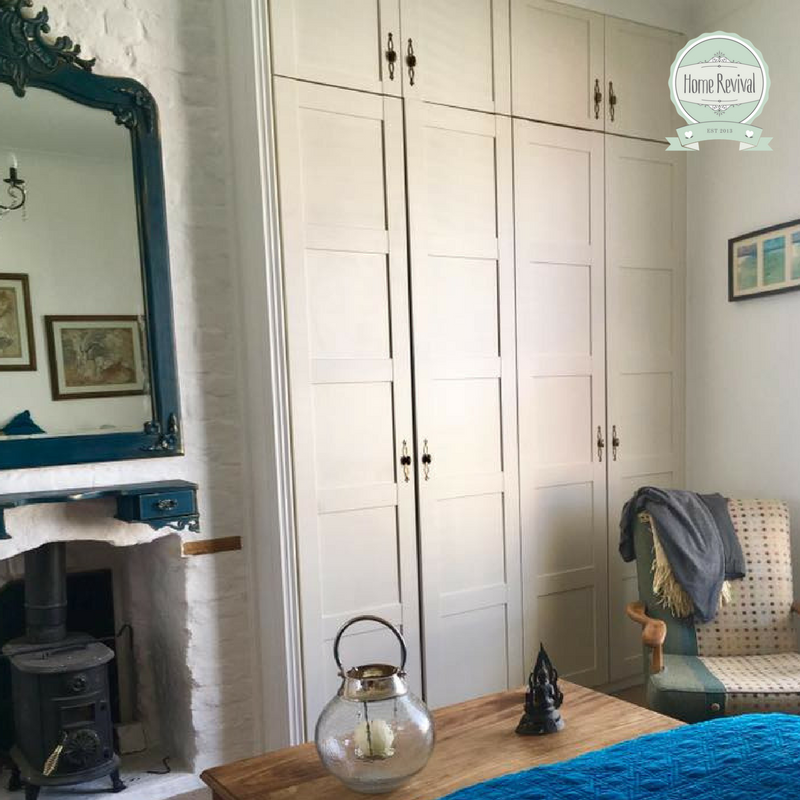 These Ikea built ins had a makeover using Cathedral Taupe from the classic Fusion range. No 5 MMSMP Farmhouse White. This is called the ‘perfect white’ not too cool or warm and the coverage is better than the other white in the MMSMP line. 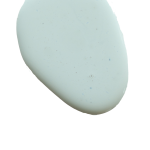 I use it for anything country and it works beautifully with any colour. Little Lamb is sneaking in on this list purely because it’s on trend and it’s our most requested colour for commission work. It’s a saturated grey that’s warm, not cool and reminds me of thunderclouds. 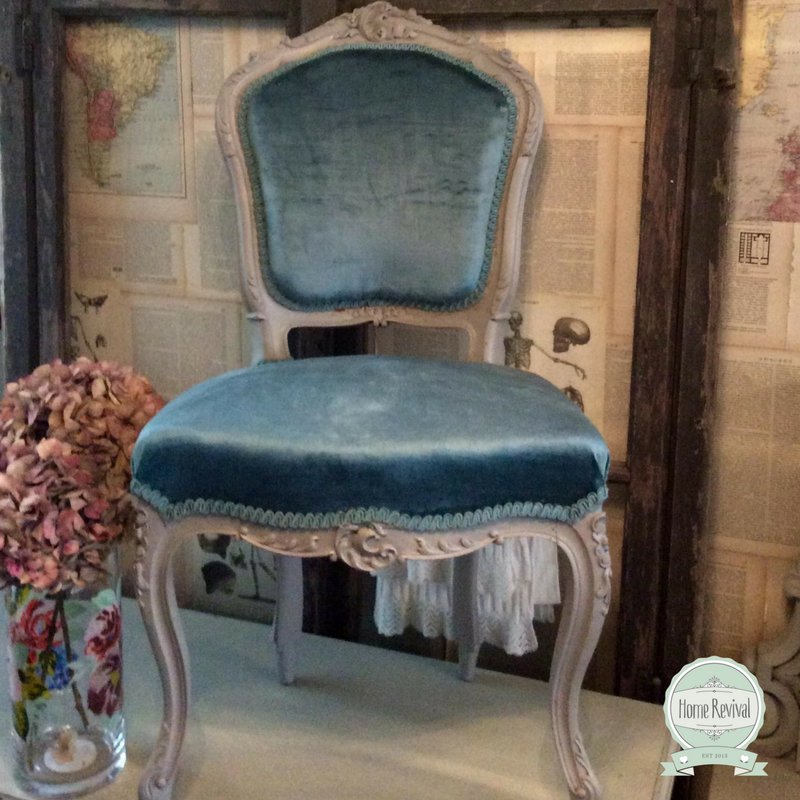 This pretty chair has a peek-a-boo floral back. 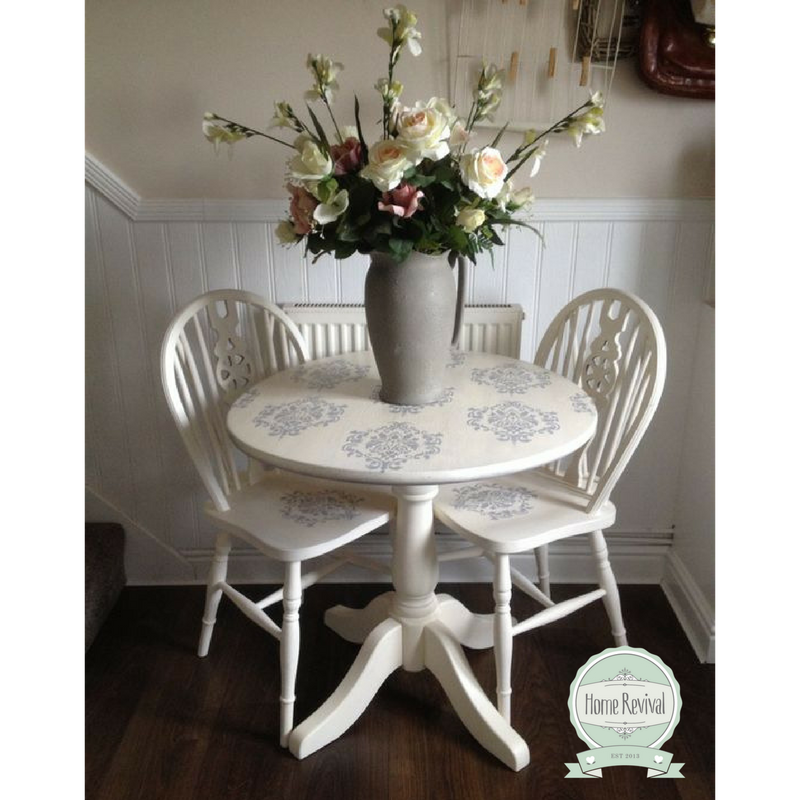 Painted with Little Lamb from the Fusion Tones For Tots range. 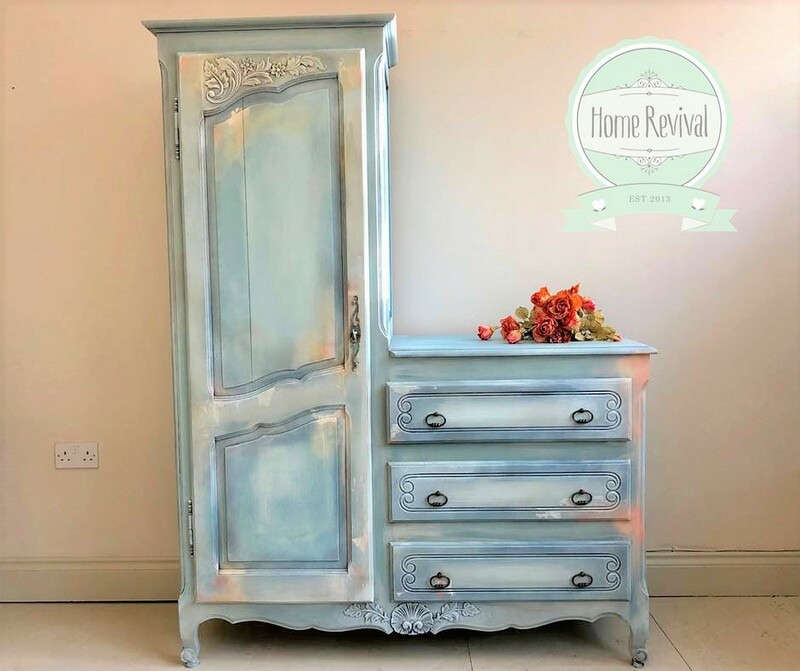 Most people would not consider this a neutral but, it’s not a saturated colour and it’s not a pastel, so it’s perfect when someone wants to inject a bit of colour but don’t want it to be overpowering. It is a grey bluey green and changes depending on the light. 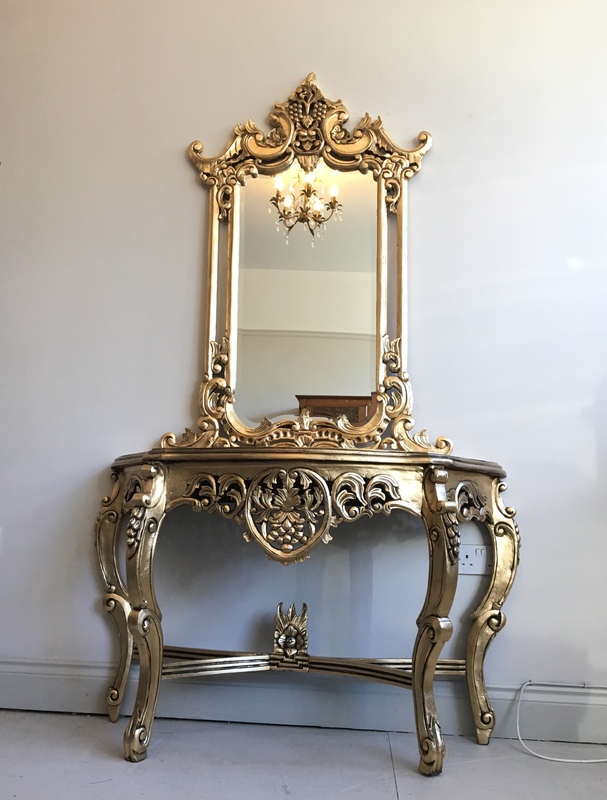 MMSMP Mora chippy French cabinet. Authentic age in an instant! 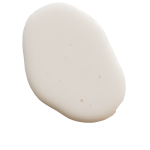 Limestone is a beautiful cream, warm and rich with a yellow undertone, it goes perfect with wood tones for the country cottage feel. 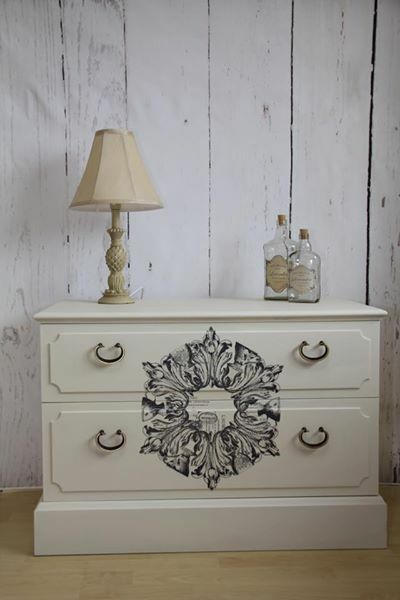 2 drawer chest painted with Fusion’s Limestone and adorned with an IOD decor transfer. Painted by my talented friend Julie Baker. 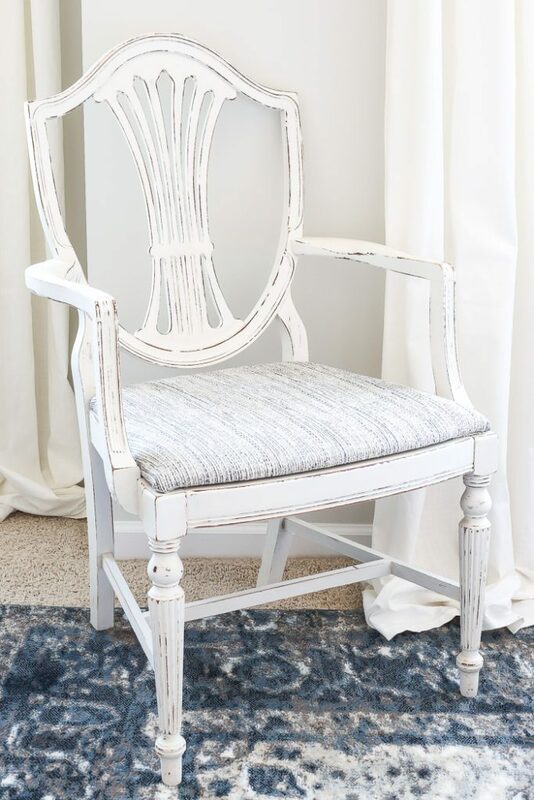 I would describe Raw Silk as a true off-white it’s not yellow or too grey, so goes well with warm interior colours or cool….like I said perfect! It always helps to see the colours in person but I hope this has helped. Leave a comment and tell me which one is your favourite! 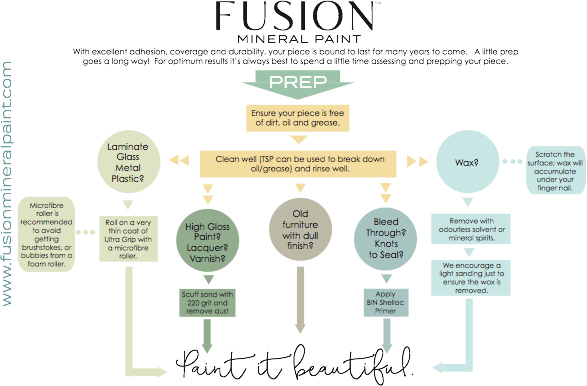 Why we love Fusion Mineral Paint. 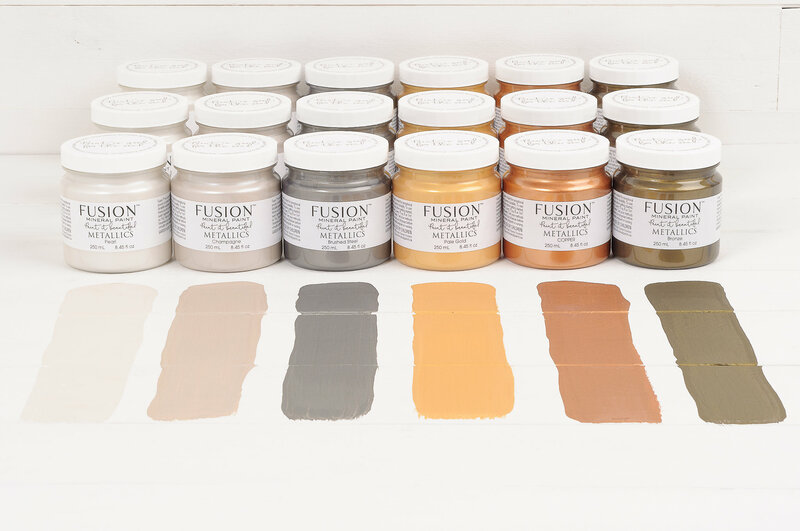 Some of the products available from Fusion Mineral Paint. 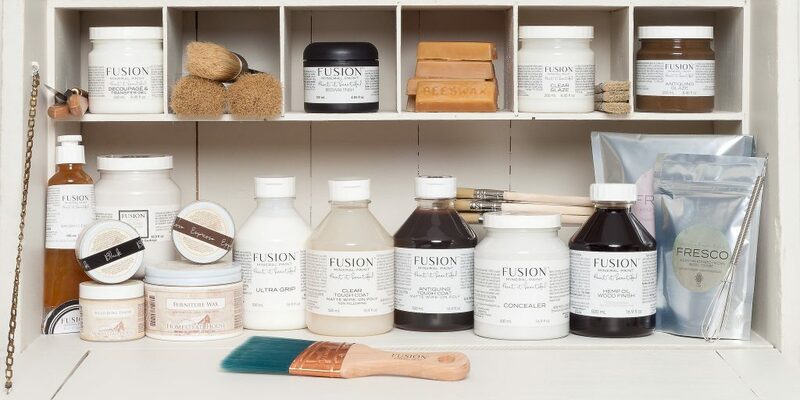 With so many different D.I.Y paints on the market, we know it can difficult to make the right choice for you and your project, Fusion Mineral Paint has made it easy! they have made a premium paint, luxurious finishes and everything in-between. We are trained and highly knowledgeable on all the products in the range so any queries and question you might have can be answered. 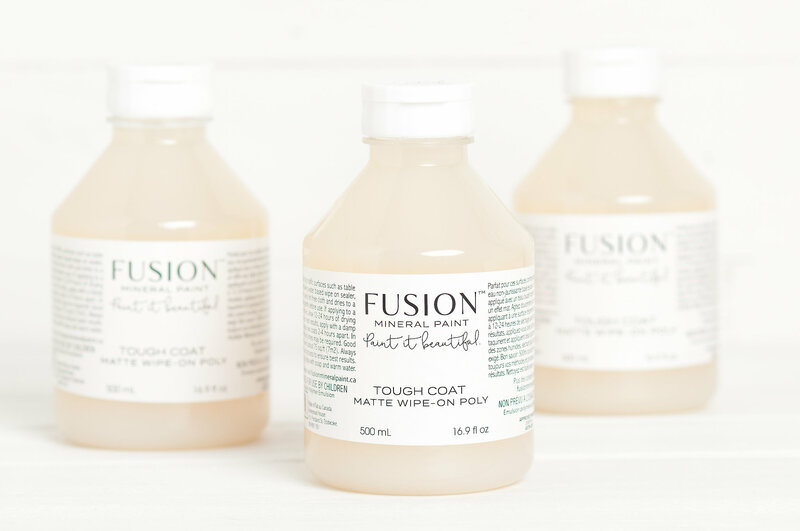 Fusion has such a diverse collection of products that it really does makes us a one -stop shop! no more running around trying to find a finishing or a prep product, We have it all! Seaside from the Penney & Co. collection. The special thing about Fusion is it has a built inTop coat! so you don’t need to wax ….. yes you read that right. Waxing can really take the enjoyment out of painting your projects and cause some real frustrations. 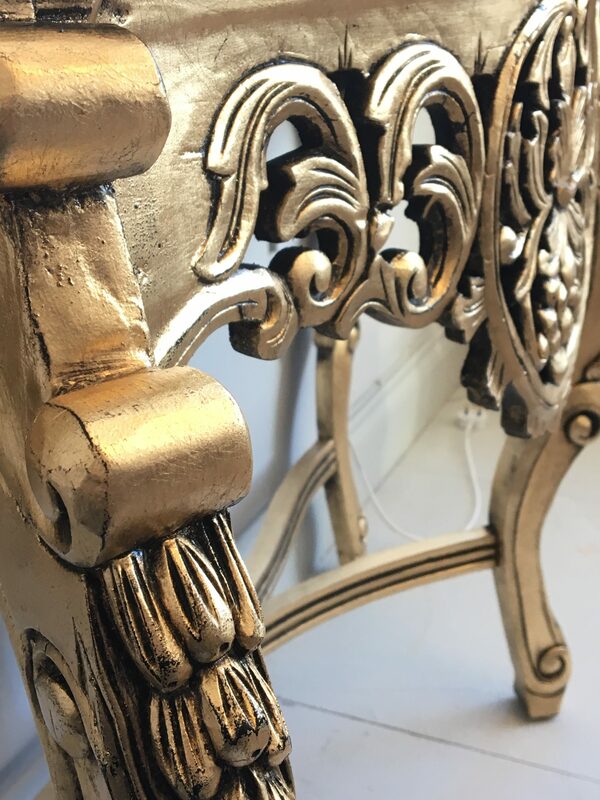 If you looking for a metallic, a finishing varnish or maybe you’re looking for a texturizing product for a special project. Maybe you need a high-quality brush or museum quality wax? We have that. Want to paint a high gloss surface like a laminate or glass? no problem Fusion has a product for that too. Let’s talk colour… there are over 50 in the entire range and Fusion has made it difficult for us to choose, from a large range of whites and neutrals to soft muted mid tones and striking vivids, this range really does have it all. We have everything you need to make your project stand out from the crowd and most importantly to make it EASIER for you. 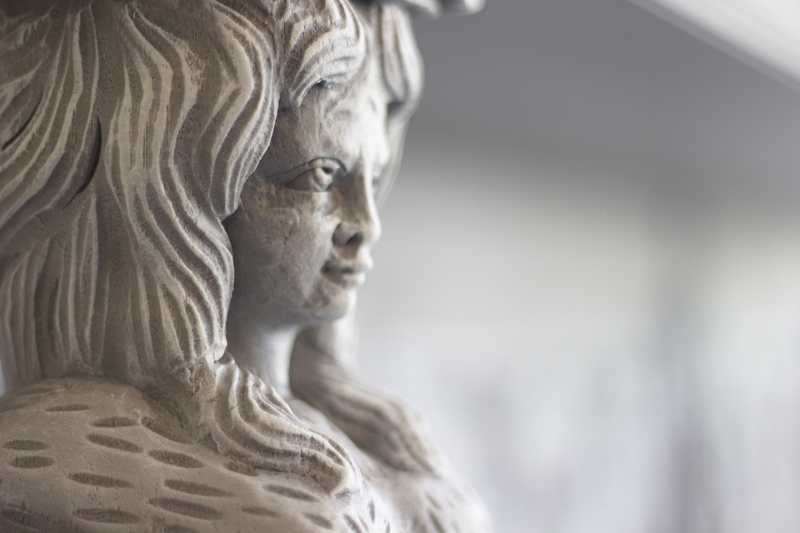 All Fusion products are made to compliment each other and work well together on the same project. Everything you need to create your masterpiece! Including getting hands-on how to’s at our workshops! Isn’t it time you joined the #FUSIONREVOLUTION ?